Expressing your appreciation for gifts received is always the proper thing to do, whether they are extravagant or not. Let the giver know how grateful you are, not just because of the monetary value of the gift, but because of the thought and extra lengths she has gone through to give you such a present. Focus on the giver (not yourself) when writing the thank you note, and tell her how you wish to see and spend time with her soon. 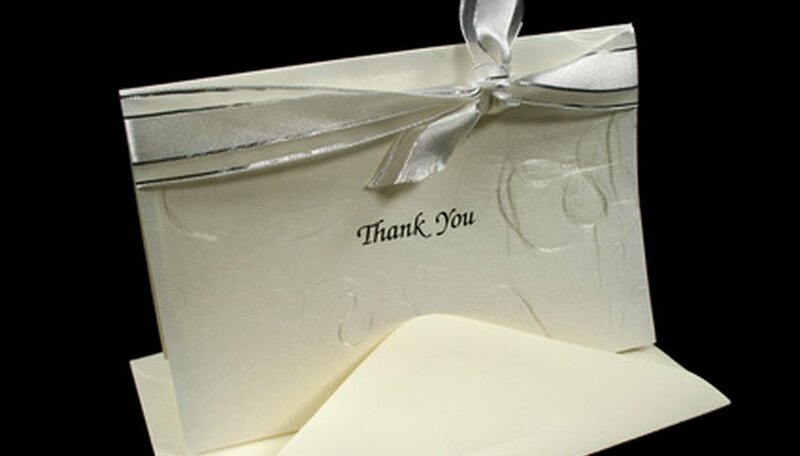 Etiquette for writing a thank you note dictates that it should be handwritten. This makes it more personal and respectful rather than mailing printed or typed thank you notes, which is simply unacceptable. Use black or dark blue ink to make it more formal and easier to read. Remember the general rule: keep it short and simple. Write a sincere message of gratitude and mention the specific gift you received. For example: "We are truly grateful for the antique settee you gave us," or "Thank you so much for the spa gift cards." Follow it up with the words "generosity," "kindness" /or "appreciated," as in: "Your exceptional generosity is very much appreciated," or "We will never forget your kindness." Such wordings express a deep sense of gratitude for how extravagant the giver had been. Indicate how you intend to use the gift or if you are already using it. Say something like, "We are truly grateful for the antique settee you gave us. It's now our favorite spot in the sitting area of our new home." Or, "Thank you so much for the wonderful crystal ware. Dinner time is now a luxury we are able to enjoy at home everyday." Be sure to make a clear, detailed list of presents and who they are from. This will come in handy when you start writing your thank yous. After completing the list, get your new Mr. & Mrs. stationery and pen, sit somewhere comfortable and start writing your notes of gratefulness. Commit to write at least five to 10 notes per day/night so you can finish them all in time. Leave your writing materials in the same spot everyday/night so it's easy to get back to the task (and the grateful mood) each time. Send notes of gratitude as soon as you receive the gift. This makes it easier for you to remember exactly what you received and enables you to say your genuine thanks, as feelings of appreciation are still fresh and current. If you are unable to send it right away, remember that you have two weeks to mail your thank you notes (for gifts received before the wedding day) and four to six weeks (for gifts received after).